We recently tried this recipe while on a friends boat for dinner. It was a beautiful night on Lake Washington with a pink sunset off in the distance. For dinner we had tacos. But not any tacos… these were pulled pork tacos with a special ingredient, “slaw”. This cabbage slaw had a kick to it, and was so good that I ended up eating 5 tacos, and might have had more, but the slaw ran out. The next week we asked for the recipe, and have been making this for lunch ever since. So, after eating the cabbage slaw for about 7 out of 10 days I’m still not tired of it. Give Robin’s cabbage slaw a try, and let me know what you think. These are approximations. Build to taste! 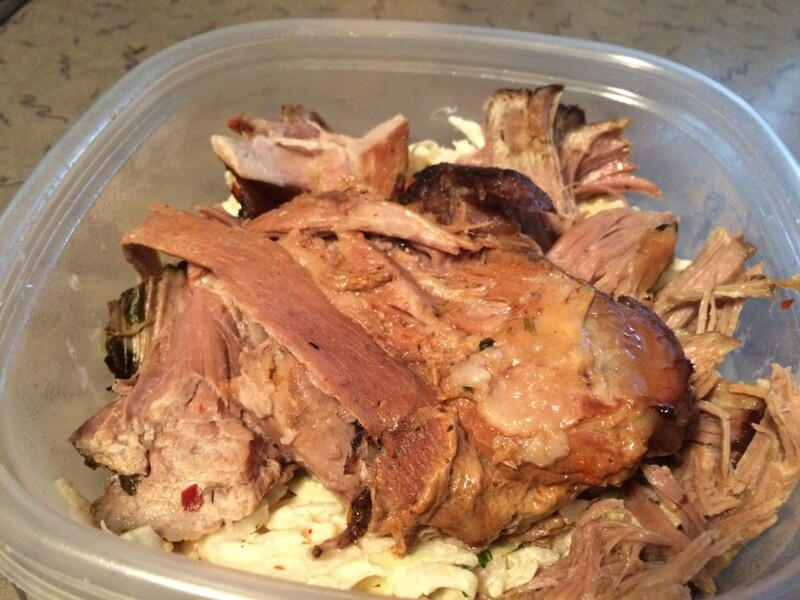 Try eating with 4-5 pound pork lean shoulder cooked in crockpot. And add sweet potatoes to the crock pot to get a complete macronutrient meal. *Pork shoulder nutrition info separate. So good! I can eat this cabbage slaw every month! There’s something about the kick, and crunch that makes it hard to stop eating.